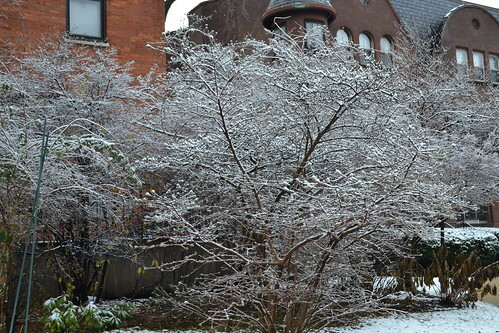 In the middle of November, we had the heaviest snow in 120 years. It started around 11 p.m. on a Friday night. On Saturday morning, the dire prediction of 8-10 inches seemed pretty silly. Heck, I wouldn't even need to shovel because the sidewalk temperatures were warmer than the snow and you can see it's melting. But, at 10 a.m., the bulk of the storm hit us. Fortunately, it was a the weekend and I figured I could take all day on Sunday to shovel what needed to be shoveled. And then this happened. My doorbell rang at 2:30. It was snowing quite hard, at this point. 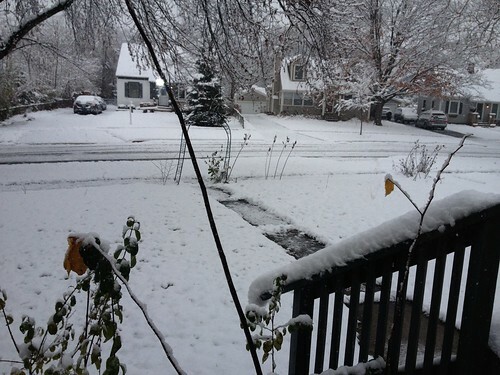 Standing on the front steps were two fresh-faced lads bearing snow shovels. "Shovel your walk and driveway?" they asked. Well, even a predicted 10 inch snowfall is not that bad for me to drive through and I knew it was going to melt fairly quickly in the upcoming week. But having people shovel the sidewalk and the driveway apron would be nice. So Chico and Josh, who live a couple blocks away from me, were paid to shovel. Entrepreneurs to the core, they were dressed for the weather and went up and down the block, knocking on doors, offering to shovel. I told them to come back with the next 4 inch or more snowfall and I'd pay them the same amount for the same work. This is so worth it to me. All I had to shovel was the deck and to and around the Jeep. Although I'm doing very well with my RA, not having to shovel the front makes life so much better. It's worth it to always have money, which I admit I don't often have, on hand when there is a rumor of snow. We were to get 10 inches. 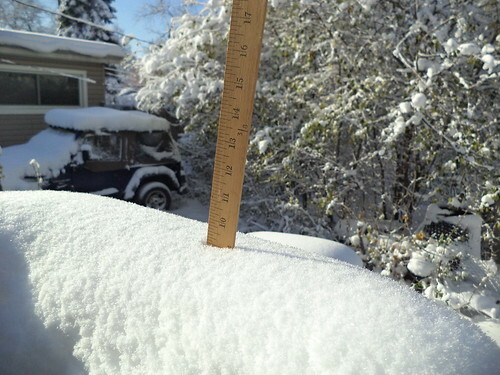 When I went out Sunday morning to shovel, I measured the amount on the deck rail. That's 9 inches. Honestly, where's my other inch? 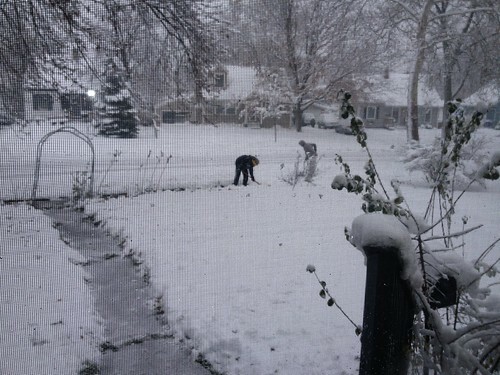 This storm was particularly funny in that it swept through the Chicagoland area with my location getting the most snow. As you drove north and south, the amounts tapered off. It was all gone by Thanksgiving. Then, December 2nd, we got another snowfall. This one coming during the week, specifically, the morning rush hour. I had to be in the city and, although I left with what I thought was adequate time, I wound up being 30 minutes late to my inspection appointment. The homeowner was understanding. One of the things I like about these early winter snows is that they have a high moisture count, so the snow clings to things. Any edge, in particular, gets outlined in white. 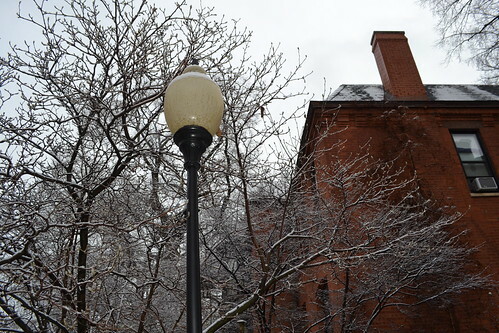 I love the contrast of dark branches with white snow. Granted, snows like this can bring down power lines and my house was without power for a couple hours during the day. Nothing like coming home and seeing your clock radio flashing at you. And, as I was walking under trees to the Jeep, I got a nice glob down the back of my neck as it melted off a tree. Memo to self: put the hood up on the coat. That's what it's there for. We haven't had any snow since and it was 63 degrees this past Sunday. Hardly Christmas weather for Chicago, that's for sure. I won't complain too much. The less I actually have to shovel, the better the winter for me. Still, the beauty of a snowfall makes a longer than usual commute and an icy back worth it.